Edit 13 December, 2013: I was alerted today that the copyright for this book may have been renewed so I have taken down the link. I apologise for the inconvenience but this is a precaution I have to take as I have no wish to violate anyone’s legal rights over this material. My aim with this book (as with all of my scans) was to make the knowledge available to everyone that needs it, free of charge. I understand that not everyone has access to the kinds of libraries that stock these books and very few people can afford to buy one, so I help where I can. I cannot, however, do so at the cost of someone else’s intellectual property rights. So please don’t write to me with requests. I’m leaving the review up as it complies with fair use, and I’ve added a disclaimer just in case. 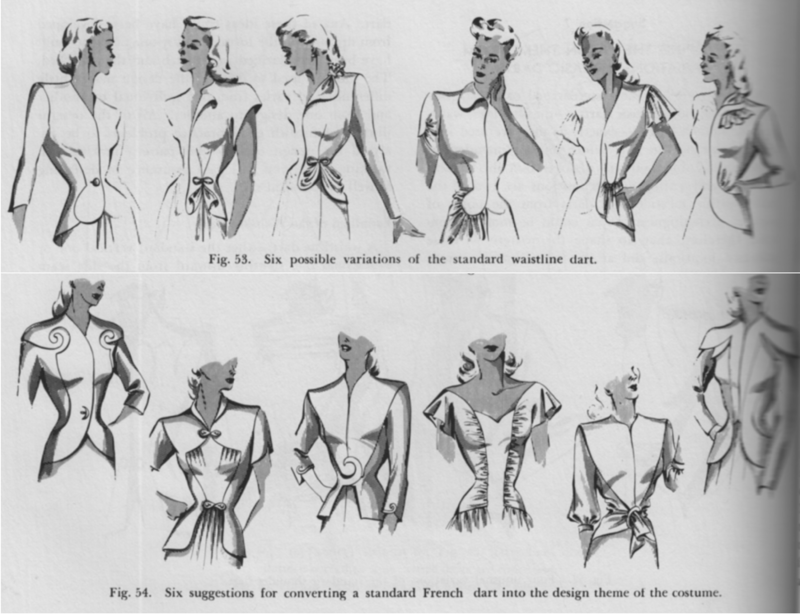 Published: 1948 copyright not renewed i.e. it’s in the public domain now. Concerned with matters relating to copyright? Please read this. Cheers. I began the year with high hopes on learning drafting and grading as ways to complement my sewing skillset, stave off boredom and just learn something new. Lacking the time to do that-I focused instead on processing and uploading this vintage gem. 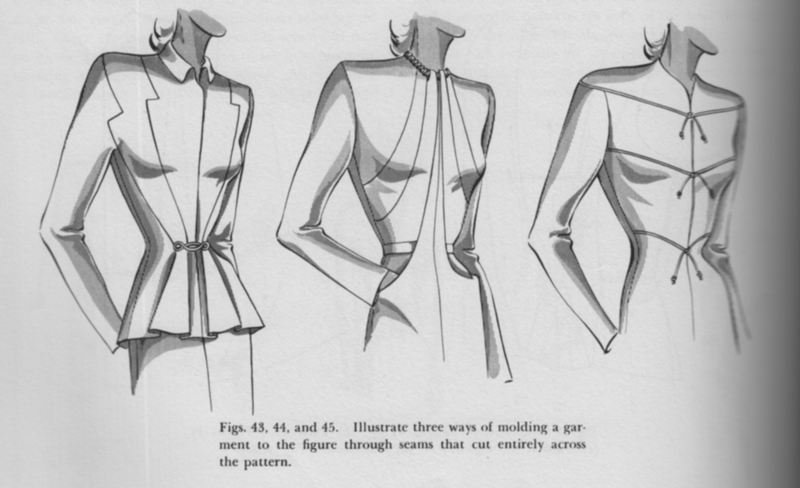 This beautifully illustrated book on draping not only outlines the actual process for draping on the form, but also goes through the subsequent flat pattern modifications required to develop variations in style and fit. 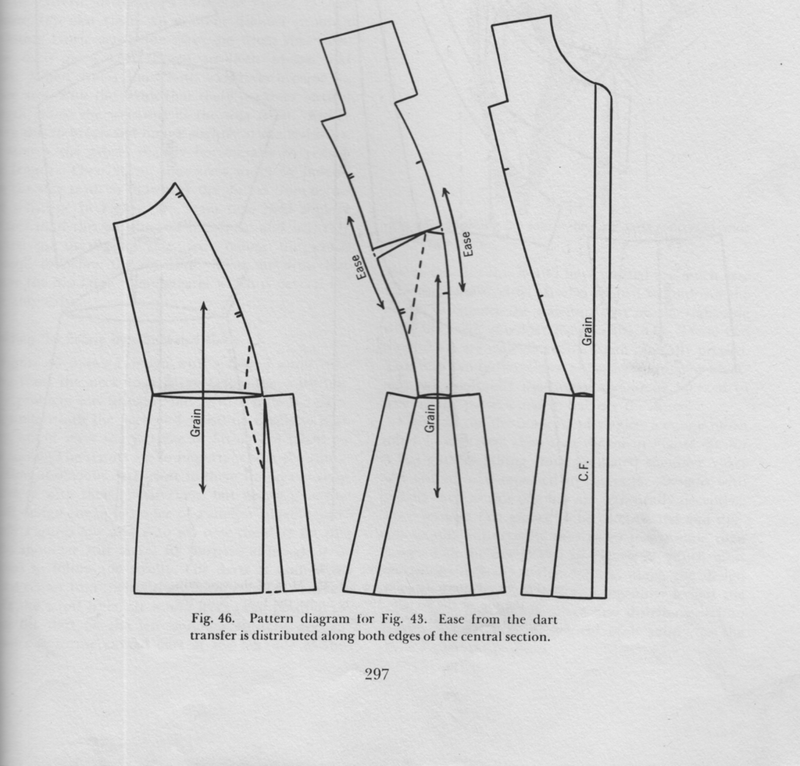 Marking the point for a gusset, effect of inserted gusset on final fit. 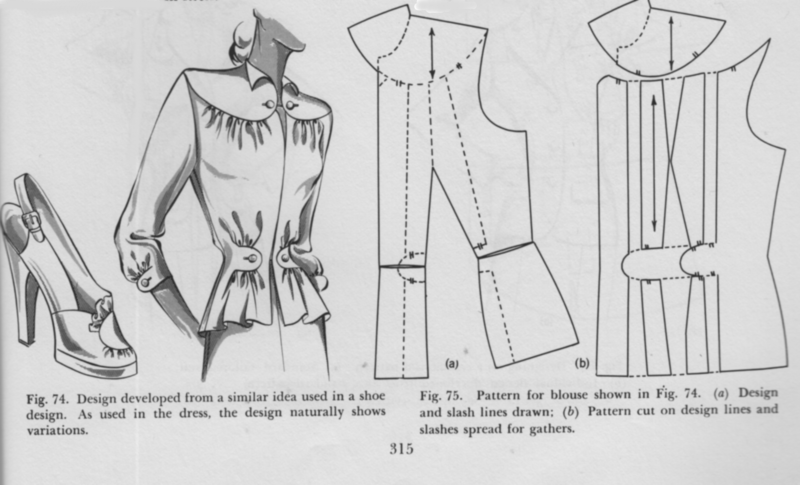 Incorporating seaming into style-lines on the flat pattern. 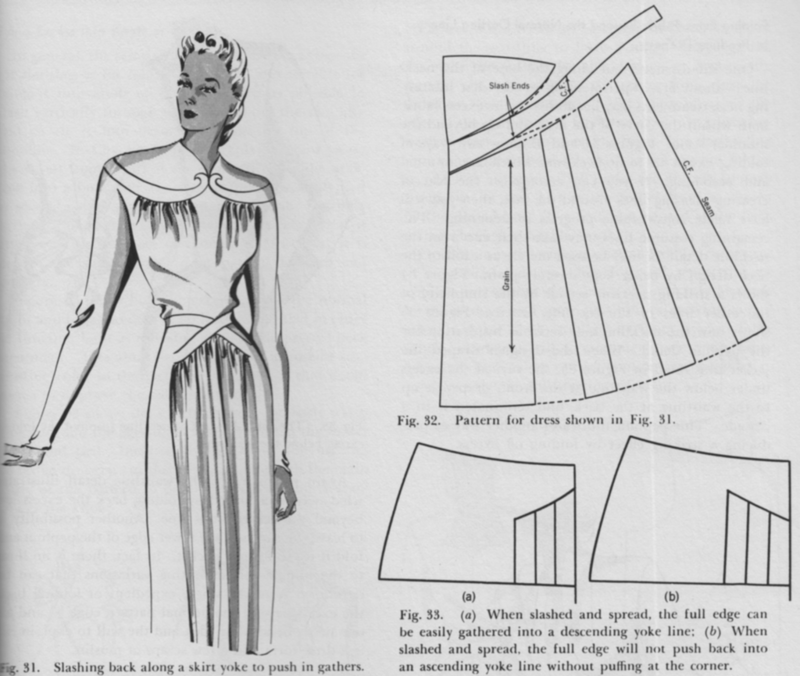 The book starts by covering such basics as the effect of fabric type and weight on the drape of finished garments and the effect of print and pattern on style lines. 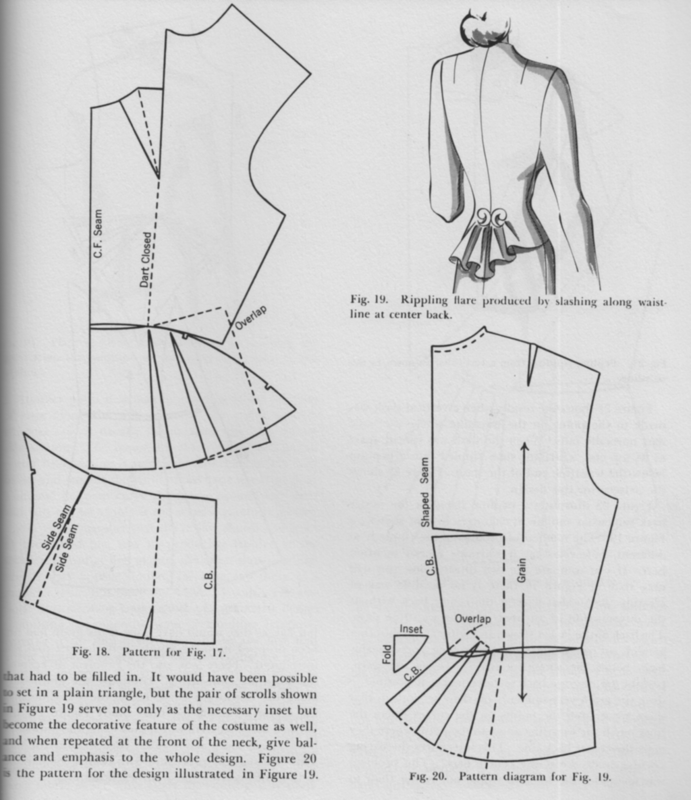 It then takes the reader through padding and setting up a dress form (based off of personalised draped bodice and skirt patterns) and then gets stuck into the actual pattern modifications part. 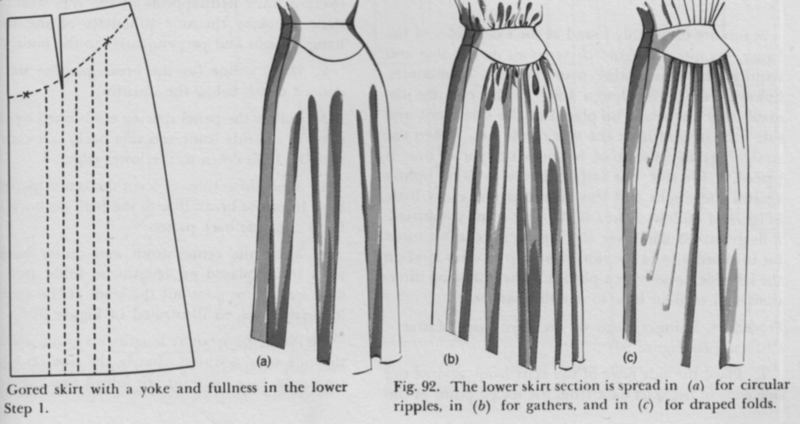 It then works its way through draping the bodice and skirt portions to create flat patterns which are then refined for silhouette and fit to create a diverse range of 40s styles (more than a few of which resemble 20s/30s garments). 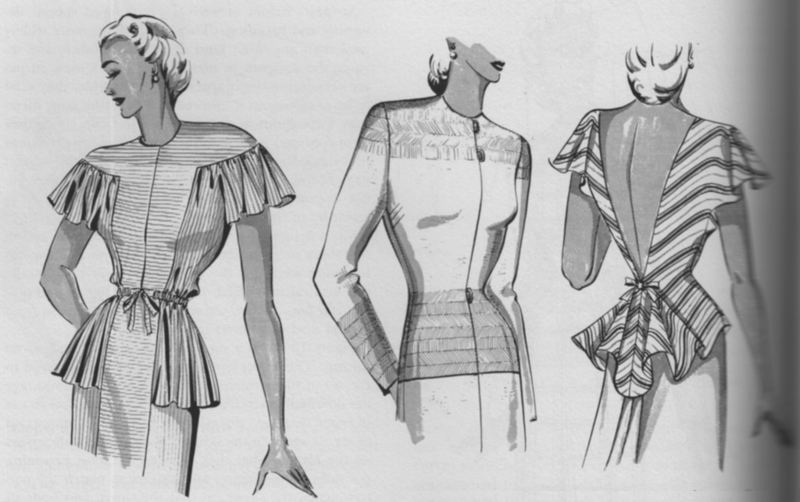 These patterns are also manipulated to achieve effects such as seamed style lines, gathers, drapes and other advanced modifications for the bodice, skirt, sleeves, collars and peplum, creating fabulously feminine variations. 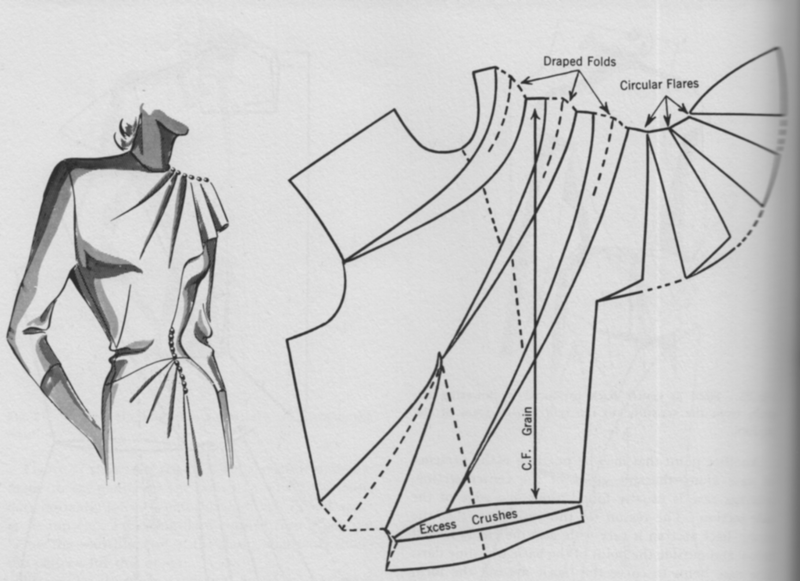 Flat pattern modification on the bodice to achieve a gathered bolero effect attached at the centre back collar. 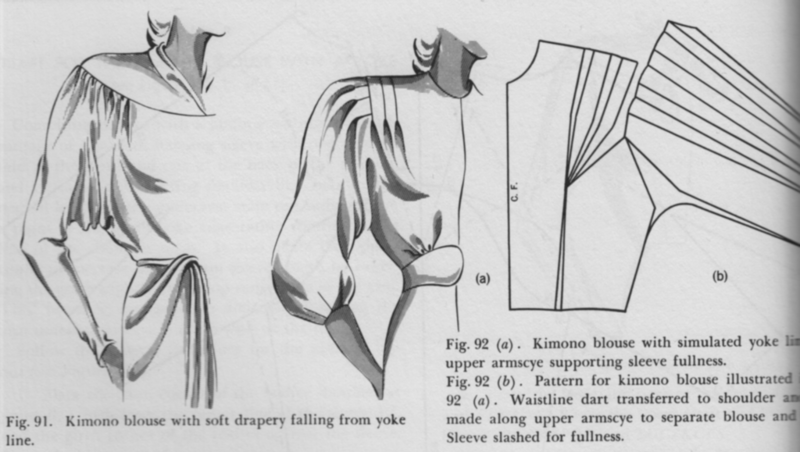 Modifying a kimono sleeved bodice for a yoked front with gathered detail. 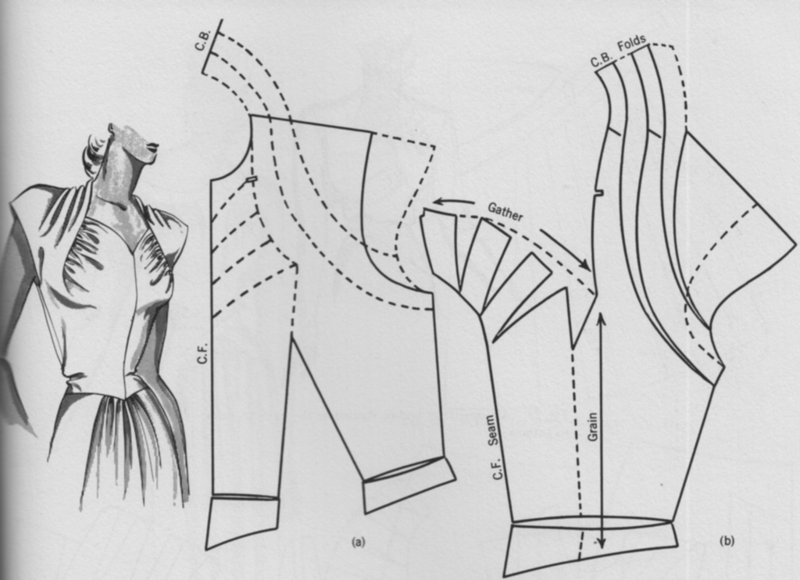 Every aspect of the process is covered with copiously illustrated instructions and descriptions both of the adjustments made to the flat pattern, as well as of the appearance of the finished garment. Collar a would make a cool snap-on accessory.. The text is precise and concise and the diagrammatic illustrations are pure eye-candy. I feel like I’ve seen this little number in one of the episodes of Star Trek the Next Generation Like something an heiress would wear on the BBC version of the Poirot Mysteries. For extra deadliness, just add pearls. 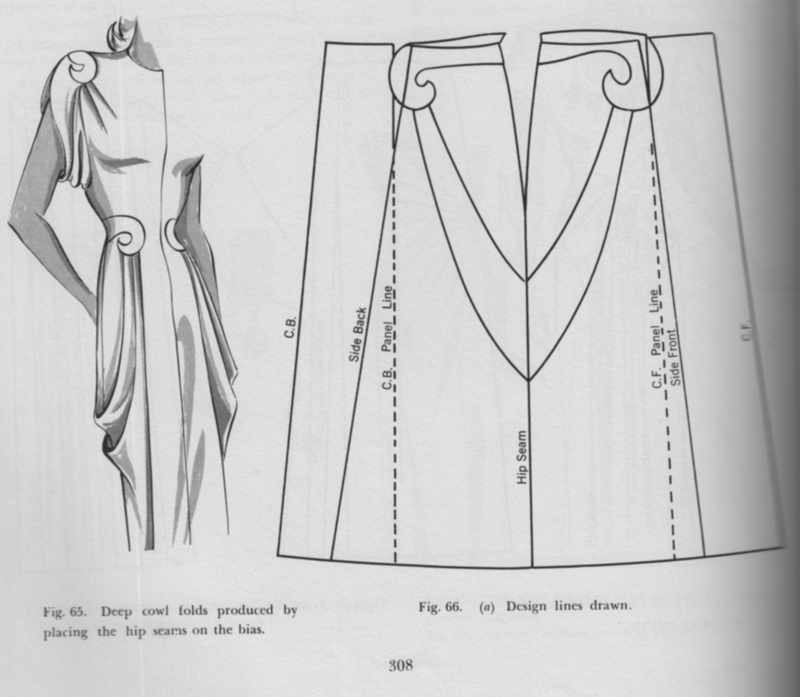 I quite like this Grecian style. Again, very reminiscent of STtNG. Back in the day when all your sh*t had to be co-ordinated. Not too sure about the rear view on that second one.. Massive thanks to Dr. B for donating the scratchproof, shatterproof scan glass I used to digitise this tome. May your conference talks be glitch-free and your publications highly cited. Disclaimer: All images remain the property of their original owners and are used here for purposes of illustration, discussion and review.